Peter Dempsey trailing on the exit of Turn 4 of the final lap of the Firestone Freedom 100, Carlos Munoz, Sage Karam and Gabby Chavez were racing side by side to the start-finish of the Indianapolis Motor Speedway. Suddenly, Peter Dempsey found a seam close to the outside wall. A bobble and the No. 5 Belardi Auto Racing car crashes before completing the 40-lap race. But spotter Stefan Wilson told him to go for it, Dempsey kept it straight and surged even with Chaves’ No. 7 Schmidt Peterson with Curb-Agajanian car yards from the checkered flag at 190 mph. 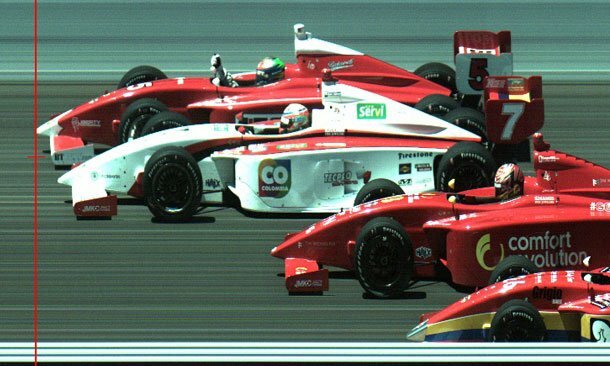 The 27-year-old native of Ashbourne, Ireland, immediately knew he had won the marquee race of the Firestone Indy Lights season, raising his left hand off the steering wheel, though it was a photo finish. The margin of victory was .0026 of a second — the closest on an oval in the 100-plus-year history of the Speedway. Al Unser Jr. beat Scott Goodyear to the line by .043 of a second in the 1992 Indianapolis 500, and none of the NASCAR races at the Brickyard come close. “Beers are on me tonight,” said Dempsey, who earned his first Firestone Indy Lights victory in his 20th start. Chaves was second and pole sitter Sage Karam was .0290 of a second behind the winner in third. Carlos Munoz, who led Laps 14-39, was .0443 of a second off the winner.